Camera follows Caucasian tourist man with backpack looking around walking along Tiber river on vacation in autumn Rome. Back view of female freelancer with backpack walking along autumn Tiber river under plane trees in Rome slow motion. 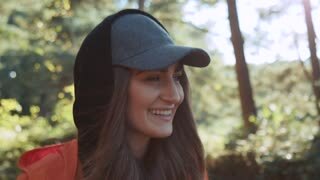 Young thoughtful tourist girl with backpack walking along autumn Tiber river bank under plane trees in Rome slow motion. 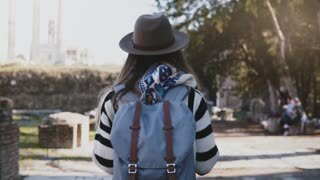 Camera follows young female tourist with backpack enjoying beautiful ruins of the Forum in Rome during vacation travel. 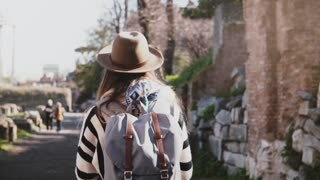 Camera follows young female traveler in hat with backpack exploring ruins of the Forum in Rome, Italy on vacation trip. 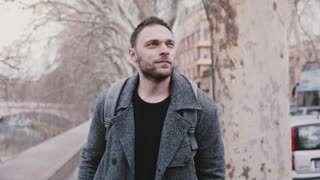 Close-up slow motion shot of confident Caucasian businessman with backpack walking along Tiber river bank on vacation. Young successful businessman tourist taking a smartphone photo on Tiber river bank in Rome, Italy on vacation in autumn. Thoughtful confident businessman with backpack walking along Tiber river bank in Rome thinking about life slow motion. Young happy male traveler with backpack taking a smartphone photo of Tiber river bank in Rome enjoying winter vacation.